The Snap-On Clamp, CE62, (sometimes referred to as a phase or conductor clamp) is precision manufactured from a robust aluminum casting with stainless steel fittings. The CE62 incorporates a stainless steel jaw, which is spring loaded to reduce application and removal time associated with clamps of the screw type. For an alternative method of application, PBwel’s S9B Line end clamp is also available. 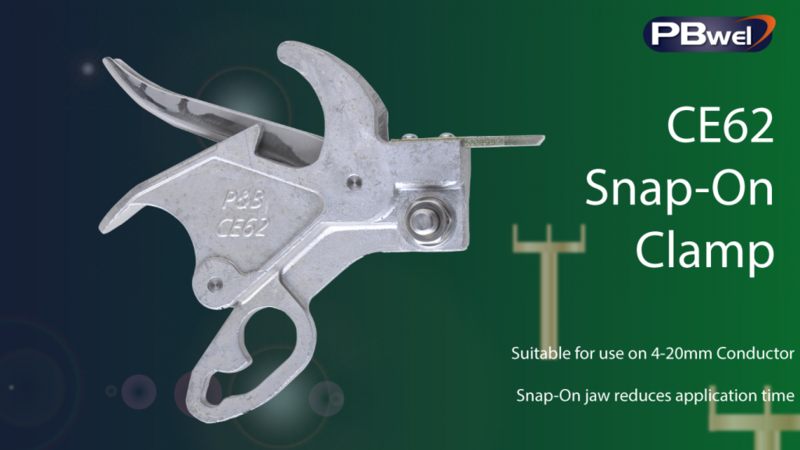 The CE62 Snap-On clamp is suitable for a conductor range between 4mm and 20mm, and has many years of proven service along with other P&B Portable Earthing Equipment. These products have been mechanically and electrically tested to ensure compliance with the relevant standards. Three interconnected CE62 clamps can be loaded onto the DH1A application head for rapid, snap on application to the conductors.